Roxane Pedrazzini joined LALIVE as an associate in July 2018. Her practice focuses mainly on domestic and cross border litigation as well as on white collar crime. 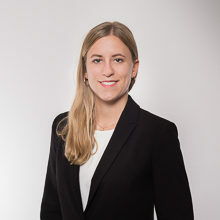 Before joining the firm, Roxane Pedrazzini trained with Bär & Karrer Ltd (2016-2018). Roxane Pedrazzini holds a Bachelor and a Master of Law from the University of Fribourg. During her Master’s degree, she spent a semester at the University of Freiburg im Breisgau in Germany and a semester at King’s College London at the Georgetown Law Center for Transnational Legal Studies in England. Roxane Pedrazzini also holds a Certificate of Advanced Studies in Legal Professions (2016) from the University of Geneva.